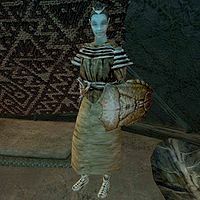 Kurapli is a Dunmer trader who can be found in her yurt at the Urshilaku Camp. She has a few items for sale, and will buy most goods. She also offers repair services. In addition to her natural resistance to fire and the sanctuary provided by her ancestors, Kurapli knows the spells Rally Creature, Rally Humanoid, Almsivi Intervention, Detect Enchantment, Tevral's Hawkshaw, Divine Intervention, Mark, Recall, Sotha's Mirror, Vivec's Feast, Spell Absorption, Telekinesis, Dispel, Detect Creature and Detect Key. "I am amazed. What an interesting story. Thank you for sharing it. Now, then.... Did you want to buy anything?" "So. You want to speak with Sul-Matuul and Nibani Maesa. I doubt that is possible. You are an outlander, and have no permission to speak with them. You cannot risk offending them. I suggest you speak with the gulakhan Zabamund. His yurt is just across from mine. With a recommendation from a sub-chief like Zabamund, Sul-Matuul might be more willing to speak with you." "I congratulate you on gaining Zabamund's help. Now, was there something you wanted to buy?" "Now that you are a Clanfriend, can I beg you to assist me with a matter of personal vengeance?" "Zallay Subaddamael, an outcast ashlander, betrayed Urshilaku hospitality and killed my husband. If you could find Zallay Subaddamael, kill him, and bring the justice of his death to me, I can promise you a fine reward -- my dead husband's enchanted Spirit Spear. It is a great treasure, but I would be glad if it might purchase the vengeance that would set my husband's spirit to rest. Bring me news of Zallay Subaddamael's death, and the Spirit Spear is yours." "You have killed the murderer of my husband, Airan-Ahhe. I thank you, and do you honor, Clanfriend. I have long kept Airan-Ahhe's spear. He no longer has any use for it. It is with pride that I pass it on to you, and ask only that you remember his name when you use it." "I thank you, Clanfriend, for giving me vengeance for the murder of my husband." "This outcast murdered my husband. I have heard that he has taken refuge in a place called Aharasaplit on the island of Sheogorad, the large island north of Vvardenfell. You might find information about Zallay Subaddamael or Aharasaplit camp in the fishing village of Dagon Fel on Sheogorad island." "Do you bring me news of personal vengeance for the death of my husband?" As a member of the Urshilaku Tribe, killing her will anger the tribe and prevent you from completing the Urshilaku Nerevarine quest, a required part of the Main Quest.